Found on Facebook: The Husband Chronicles. Posted on November 20, 2013 Categories Green Living HistoryTags family, girl, Husband, motherLeave a comment on How Did the Human Race Appear? Forgive me Diary, it’s been…. a long time since I’ve written. Not that I’m Catholic and guilty of anything in particular, I’m just using being busy with nothing much as an excuse. I wonder what stuff is playing in your head as you read this? Do you have show tunes, oldies, or something entirely different? I’m hearing big band (I think that’s what it’s called). Earlier it was Rainbow Connection by Willie Nelson but that was because I heard it earlier (outside of my head but now, of course, it’s inside my head). Before, or somewhere between, I was listening to an orchestra and watching Fred Astaire dancing in a ballroom. His partner had a long, white glittery dress. But, it was all in black and white so in fact the dress could have been another colour entirely. These are the days of my head. A lot seems to be going on in there. Any time I stop to watch there are usually dancers of some sort. I like the Irish dancers and the fiddle music especially. Do other people have all this in their head usually? These are the things I wonder. Now I’m thinking about that white gown and redesigning it. It’s starting to have a beach theme, there is a pattern like gentle waves along the hem, about five inches up the skirt from the bottom. Still all in white though. Sleeveless, just white straps at the shoulders, not those spaghetti straps (this is a dress she has to dance in after all, it wouldn’t do for her to have it falling off due to a strap breaking). A hat would be kind of nice but impractical for the dancing. Still.. it’s my head and I can have her wear a hat if I want to. Something that looks like a partially squashed top hat, a bit informal like that. No veil this time. But it’s white and has the same snow-like glitter as the dress. You’ve probably seen enough of my head now. About two days later and I still feel a bit weird headed after the clunk from the bow window. I must not have a concussion or anything to worry about. But maybe something is wobbling around up there. At least the headache isn’t very noticeable today. I can still spell my own name and I know what day it is (I looked at the calendar). So I’m not worried about it, just keeping a check on myself till it all feels right again. It is a lovely day today. The kind I like anyway. Just a non-weather kind of day. It’s a bit breezy and cool. My Mother the snowbird and gardener doesn’t care for it. But, for me it’s just about perfect. Not hot or humid. I could just about talk myself into going back to bed to enjoy it properly. It helps that I’m actually tired and would love to have an hour nap, or so. My Mother is planning a Bling Party for the Winter. She puts on a party once a year when she is down in the retirement community in Florida. I forget how we got the bling idea. But it is in progress now. It’s a lot of fun. She is going to be Her Royal Bling-ness and Zack is King Possibling. This was in an email sent to my Mom. This picture stood out from them all. Gave me a tear when I looked at it. This is the real reason the war must end. 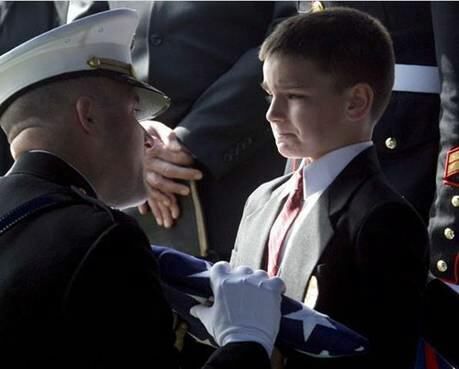 A little boy should not have to cry for his Father or Mother in this way.